He started talking really fast about not being too sentimental about anything and how we should approach the sorting method. It might have been the eight shots of espresso in his latte talking, but my takeaway was this: we had a linen problem, and in about 20 minutes he was leaving to pick up the kids and this would be my linen problem. 2. I don’t have to keep linens for nostalgic reasons. I mean, if someone makes you a quilt or you have a personalized blanket, keep it. Even binkies can stay. But my youngest kids are 11 and I have three crib sheets. They were cute to look at, but I got rid of them. 3. Newer sheets are better. Two words: thread count. When I was first buying my own for college, Oprah was spending her billions on 1,200 thread count but 400 was a pretty nice standard. Now, my kids have 400 and if I ever wind up sleeping in their beds (another story) I feel like I’ve slept on sandpaper. I think that thread count is still maybe the same, but they’ve made cotton blends and any number of advances in sheet softness. Worth checking out. 4. Sheets come in sizes they are shy about sharing. I spent most of the time unfolding and refolding sheets and desperately looking for tiny faded tags that may or may not say the size of the sheets. Twin are easy to tell, but the difference between full, king and queen is tricky. Plus: I don’t have beds in all sizes anymore. Why do I have several sets of sheets for a bed size I don’t have? Are we going to fail "Sleeping on a King Sized Bed 101" and get demoted back to a queen? That is not going to happen. 5. 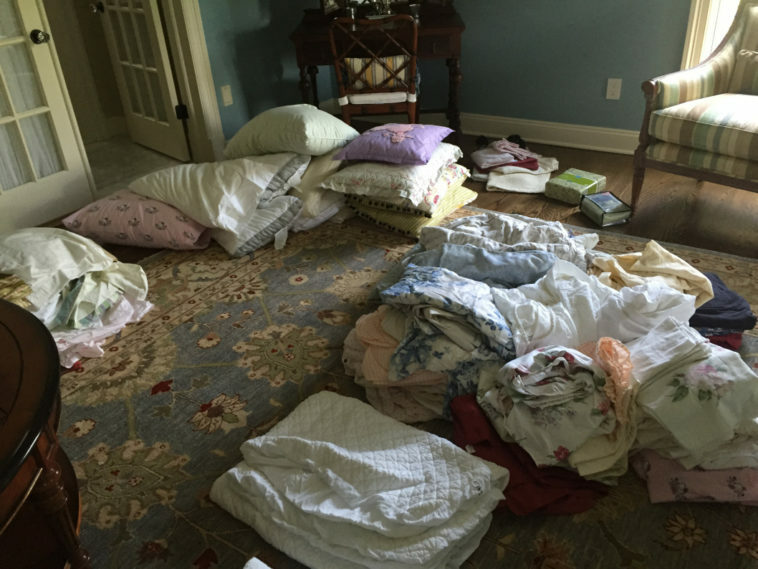 There’s nothing – other than making a sheet fort – to do with an incomplete sheet set. Sure some people will just put all different sheets on the bed, but you are a grownup now, and you can have matching sheets. Or in my case I DO have matching sheets, they were just hiding out in different closets around the house. 6. Those extra blankets can find a home. Our local animal shelter is always looking for old linens to use for their dogs and cats. 7. Keep enough for your beds plus a backup and that’s it. I was looking at a pile of old blankets and I thought “What if there’s an EMP and we have no heat. Won’t everyone be so greatful that I didn’t give away all these warmth-providing blankets?” To this I say: probably not. We already have enough for our beds plus a backup. Plus all our clothes! But then again, I’m an ill-prepared housewife, so maybe not the one to listen to about that stuff.